Image of Messier 47 taken with the MPG/ESO 2.2-metre telescope at ESO’s La Silla Observatory in Chile. A new image of a well-known star cluster in the southern sky, shows off hot blue stars sparkling amid red giants. The blue stars are younger and hotter, while the red stars are cooler. Examining the Messier 47 star cluster using spectroscopy reveals that the red stars have short lives and are further along in their lifespans than the blue stars, which aren't quite as massive. Today (Dec. 17), the European Southern Observatory (ESO) released the photo, which was taken with the MPG/ESO 2.2-metre telescope at ESO's La Silla Observatory in Chile. The cluster is about 1,600 light-years from Earth and was first spotted in 1654 by Italian astronomer Giovanni Battista Hodierna. It was independently discovered by Charles Messier, for whom the cluster is named. But Messier didn't record its location in the sky accurately. The star group was rediscovered under the catalog name NGC 2422 and was not identified as Messier's until 1959, by Canadian astronomer T. F. Morris. The star cluster Messier 47 and Messier 46 shines in this pictures from ESO’s La Silla Observatory in Chile. Messier 47 only has 50 stars visible from Earth in a small region, about 12 light-years across. Many other star clusters seen from our planet can have thousands of stars in the same distance. In the sky, Messier 47 appears to be close to another star cluster called Messier 46, but the latter one is much farther away at about 5,500 light-years. Messier 46 also has more stars, but is fainter from Earth because it is so much more distant. 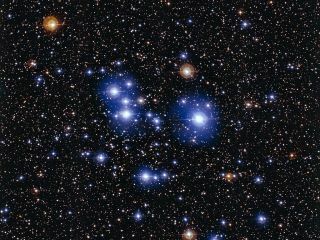 "Messier 46 could be considered to be the older sister of Messier 47, with the former being approximately 300 million years old compared to the latter's 78 million years,” ESO representatives said in a statement. "Consequently, many of the most massive and brilliant of the stars in Messier 46 have already run through their short lives and are no longer visible, so most stars within this older cluster appear redder and cooler."